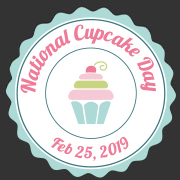 Download the items below and get your Cupcake Day Party started! When you register for National Cupcake Day™, and make a self-donation of $25 or more, you will receive a Cupcake Day Host Kit by mail which will include the items below and a few more special items! (Host kits will not be mailed out after Feb 20, 2019). Click the links below to download!